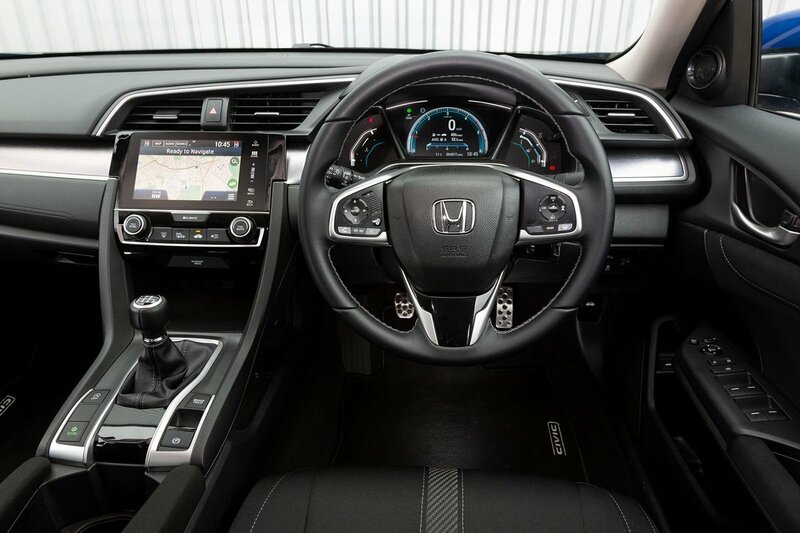 Honda Civic Saloon Interior, Sat Nav, Dashboard | What Car? Like the hatchback, the Civic Saloon has a low driving position with the gearlever set quite high to make snappy gearchanges easy. Even though you're sitting low, visibility is good as long as you’re looking forwards. Try to do a spot of reversing, though, and the narrow rear window and thick rear pillars make it hard to see out. Thankfully, all but SE models have front and rear parking sensors along with a rear-view camera. The seats are comfortable and provide decent side and thigh support, and electrically adjustable lumbar support is standard on SR trim and above. It’s a shame that adjusting backrest angle is so fiddly, though: you have to pull a lever and shift your weight back and forth. The steering wheel also has plenty of adjustment and the pedals line up nicely with the driver's seat so you don't need to sit in a crooked position. The air-con controls are also easy to reach and intuitive to use. 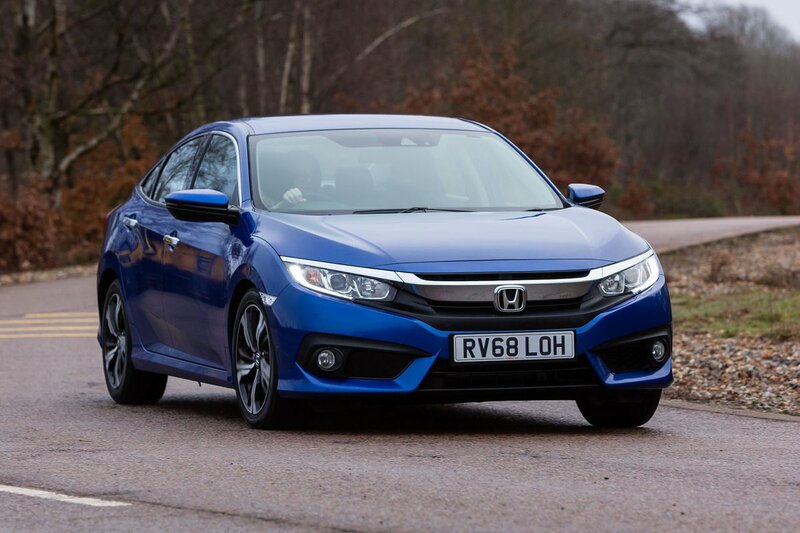 Unfortunately, the Civic’s is badly let down by its infotainment system. It’s standard on all but entry-level SE trim and – we won't beat around the bush – is one of the worst systems of any modern family hatch. Its 7.0in touchscreen is disappointingly low in resolution and is angled inconveniently upwards. Worse still, the menus are complicated, the screen is often sluggish to respond and even tweaking the volume is frustratingly fiddly. Mercifully, Apple CarPlay and Android Auto smartphone mirroring are standard on SR trim and above, so you can effectively bypass Honda's operating system and use the touchscreen to control your phone instead. If you opt for SE trim, you get a basic AM/FM/DAB radio with a 5.0in display. SE and SR come with an adequate eight-speaker sound system, while upgrading to EX trim gets you a punchier 11-speaker stereo. 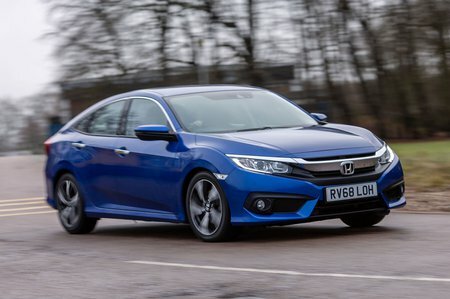 While the Civic’s interior quality isn’t up to quite the same standard as, say, a Volkswagen Golf or Audi A3, it is a step up from what we’ve seen before from the Japanese manufacturer. There aren’t as many soft-touch plastics as you'll find in many European rivals, but the Civic's dashboard feels well screwed together and the climate control’s rotary dials are pleasingly weighty and click reassuringly when you twist them. Put simply, you won't feel short-changed.